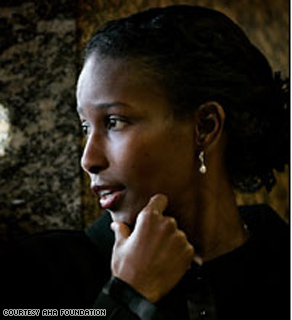 Program Note: Don't miss Anderson's conversation with Ayaan Hirsi Ali tonight on AC360° at 10 p.m. ET. Ayaan Hirsi Ali founded the AHA Foundation in 2007. In response to ongoing abuses of women's rights in the name of fundamentalist Islam, Ayaan Hirsi Ali and her supporters established the AHA Foundation in 2007 to help protect and defend the rights of women in the West against militant Islam. Through education, outreach and the dissemination of knowledge, the Foundation aims to combat several types of crimes against women, including female genital mutilation, forced marriages, honor violence, and honor killings. The Foundation is opposed to the adoption of dual legal systems to adjudicate family disputes in religious families and supports the separation of all religions and the State.